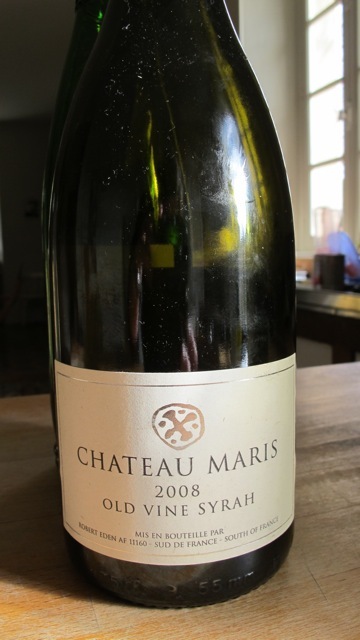 CHATEAU MARIS ‘OLD VINE SYRAH’ 2008: An old fave of ours, and good for drinking now… though we’re enjoying the Carignan variety of that year a little more even! 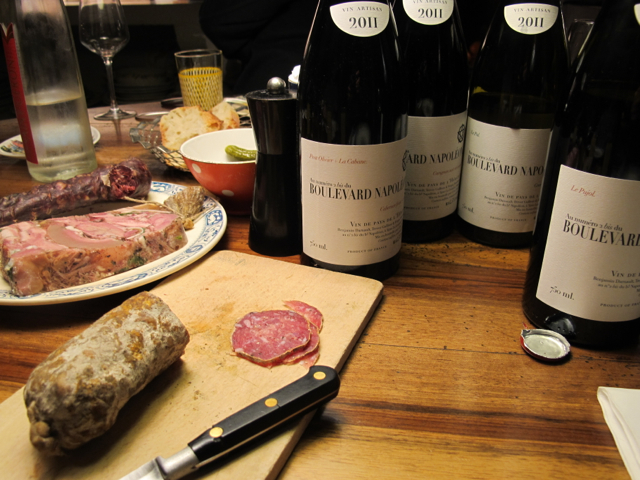 BENJAMIN DARNAULT MINERVOIS 2010 We finished all the bottles at home before I remembered to take a photo of it!! One of Benji’s most popular reds with Naked: a smooth, fruity and refreshing red that is full of flavour and can be served with almost everything, and on its own is delicious! In Summer we tend to put it in the fridge and serve it slightly chilled. Really yummy. CHATEAU MARIS ‘CONTINUITE DE NATURE’ 2008: This is made from the local grape variety ‘Carignan’ and the wines made from this grape can be quite rustic. This is a great bottle, however (with the 2009 one of our favourites). It’s smooth, velevety and has a beautiful aroma. 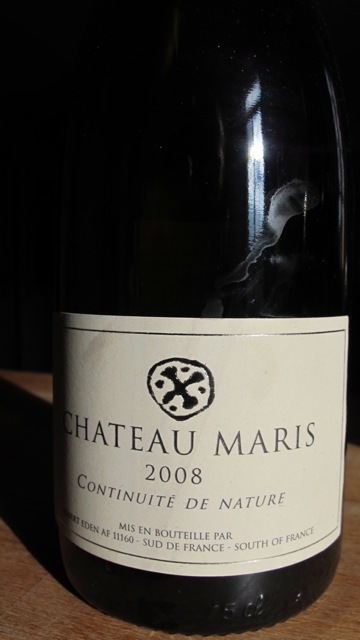 CHATEAU MARIS ‘CONTINUITE DE NATURE’ 2009: the same qualities as the earlier vintage, maybe a little better! 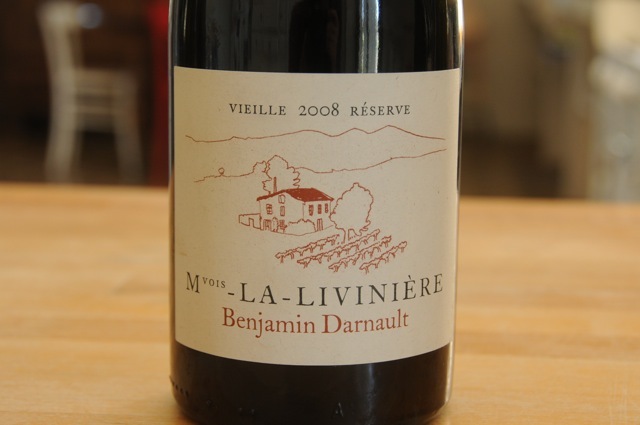 BENJAMIN DARNAULT MINERVOIS LA LIVINERE 2008: This is a relatively complex red that needs to be left opened for a while before drinking. Very much enjoyed by Benji but for me there is an aroma that I can’t quite get used to when the wine is still relatively young – this aroma is from the fact that it was carbonically macerated. Not for me, personally (sorry Benji!) but a lot of people enjoy this element. 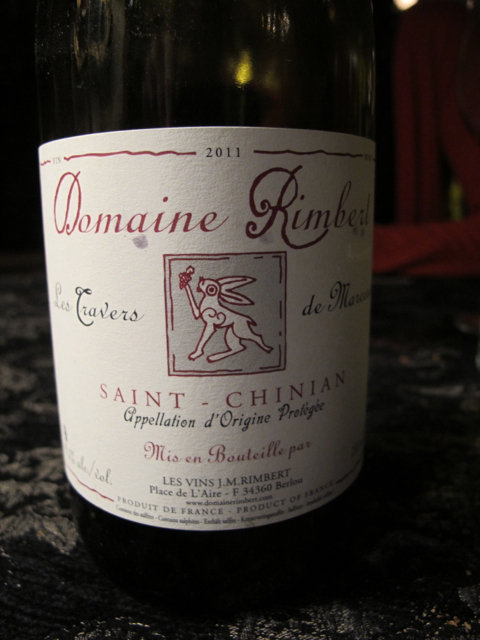 AOP ST CHINIAN 2009: This has to be one of my favourite reds in the Benji’s Naked range. A big red that does well with opening well in advance, but once aired the nose is beautiful, complex and a good body. I really love this area for wine. A good red for meat dishes, but I must say it’s always great to try a red you love all on its own first. 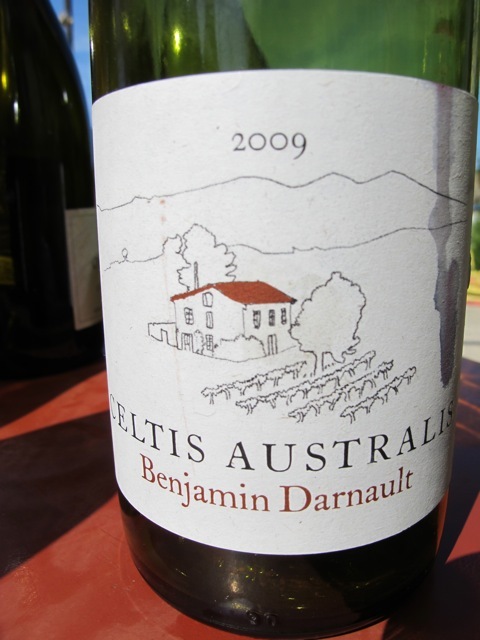 BENJAMIN DARNAULT CELTIS AUSTRALIS 2009: This is a relatively new wine to Benji’s range, and is a blend of syrah, grenache, mourvedre and carignan. To quote Benji – “The name is Latin for hackberry, a local tree which grows very well in the region. I love the tree and the name is ringing with my link to Australia”. 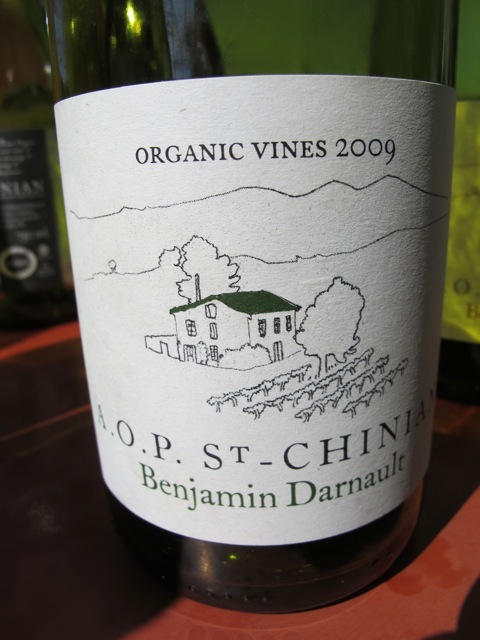 BENJAMIN DARNAULT AOP FAUGERES 2008: Now this one is a delicious bottle! It’s a syrah that’s been aged in barrel for 18 months and relatively young in the bottle so neds a good time being left opened before drinking. Great robust red that matched our duck breasts ‘magret de canard’ beautifully. 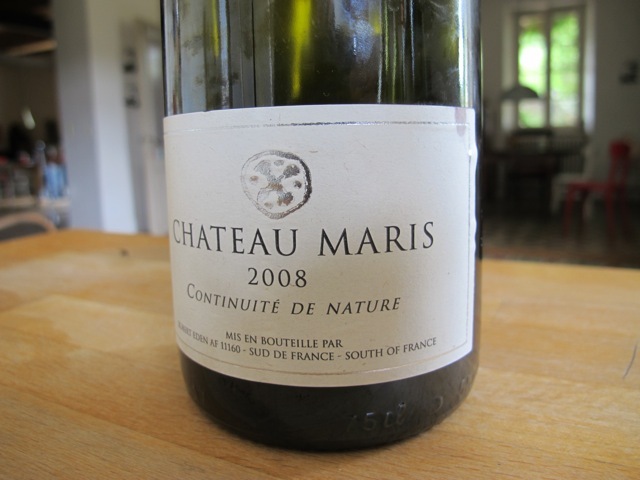 Chateau Maris ‘Continuite de Nature’ 2008: yes, you’ve seen this one before. One of our absolute faves at the moment and tasting well everytime. 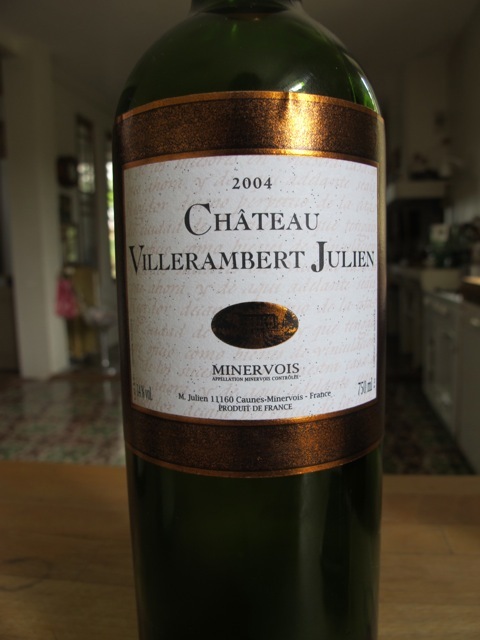 Chateau Villerambert Julien 2004 Minervois: a very old family winery dating back a few generations, in Caunes-Minervois, one of the most picturesque villages around here, known also very well for its ‘Caunes marble’ – a rich, deep pink/ochre colour streaked with white. I think this is a syrah/ grenache blend and was enjoyable but the wood a little too strong. 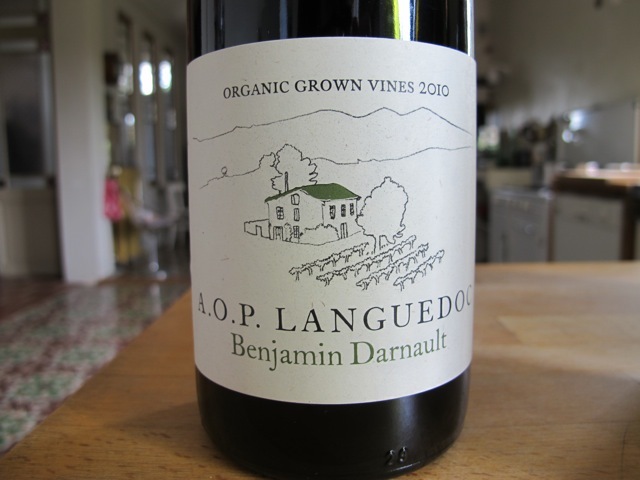 Benjamin Darnault AOP Languedoc 2010: a wine from the Naked range. A delicious ‘big’ organic red from St Chinian, one of my favourite appellations in the Languedoc. 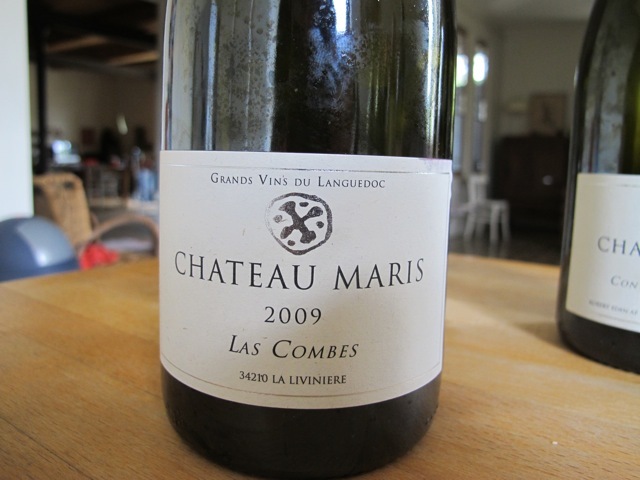 Chateau Maris ‘Las Combes’ 2009: one of Benji’s again… this actually the ‘Old Vine Grenache’ in a different guise… a gorgeously fragrant grenache, with beautiful, soft tannins on the mouth. 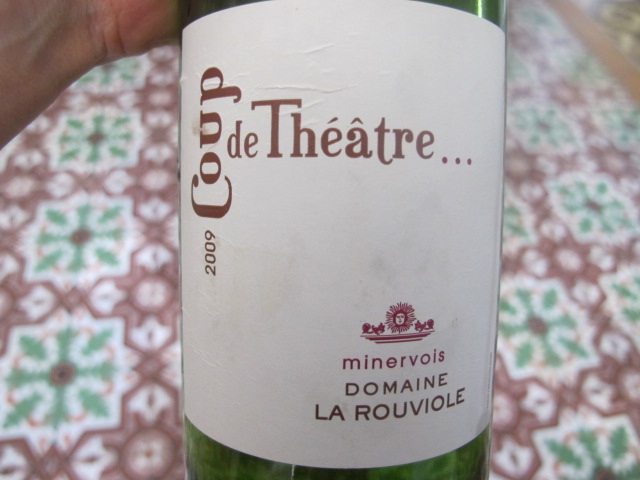 DOMAINE LA ROUVIOLE, Coup de Theatre 2009. This delightful wine is from Siran, right on our doorstep and so easy to drink. A 100% Cinsault. One of the faves this Summer. Nice syrah but the two grenache (Nouvelles Fraîches and Old Vines) are incredible! I am a Naked follower. I absolutely loved the Faugeres, so much so that I scoffed my box of 12! Is Ben going to do a new vintage of this delicious wine? or is he onto something even better? I’m really happy to hear you’ve liked Benji’s Faugeres so much. It’s very kind of you to say so! 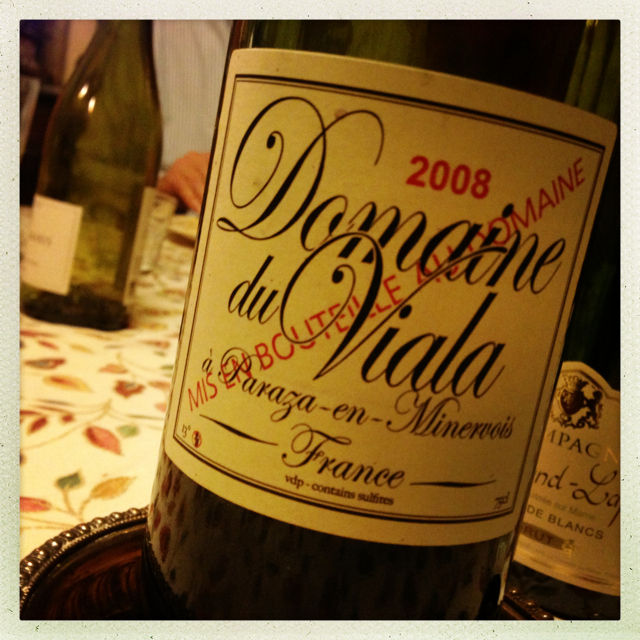 I loved drinking this wine too – and unfortunately we don’t have any left either!?!! For him the following vintage wasn’t as good, so he hasn’t put any into bottle, so no Faugeres this year. But my favourites of his at the moment are definitely the AOC St Chinian and the Cotes du Roussillon – and then there’s the Minervois for everyday drinking… the list goes on! Hi Guy. Please excuse my latemess in getting back to you. I have been ‘awol’ of late, for some unfortunate reasons, but am back and enjoying keyboard actvity! Thanks a lot for your message it’s great to hear you are enjoying our area. I agree, St Chinian is just lovely (the wines from thieir terroir are some of my favourites) and I’m happy to hear you come back each year! This project of yours sounds interesting, it would be great to hear more about it. Please just get in touch again closer to the date. Wow, it is a small world, I can’t believe you’re at Rick’s – and you’ve already enjoyed a drink with lovely Emily! Crazy. It would be great to meet up´with you and Karyn. How about at our house in La Liviniere? We have family arriving on our doorstep this weekend, and then will be away next week (school holidays). What about the week beginning the 5th of May? We’d love to have you over for a ‘verre’ that week, or anytime after. How long did you say you are here for? Ok that’s great to hear it Guy. I’ll get in touch next week while we’re away and we can work out a day. Thanks a lot for your mail after last week’s get together! 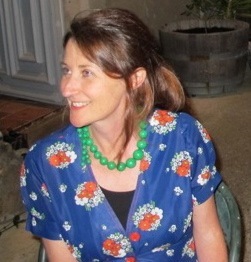 We had a great time too, it was lovely to meet you and Karyn over some wine. Re your question about coming over, would Wednesday afternoon work for you? Tuesday and Thursday afternoons are a bit tricky I’m sorry to say. I have your number now, so I will give you guys a call tomorrow.